Squarespace is a DIY website builder solution that allows you to create attractive and engaging websites. It offers an array of features, capabilities and easy to use tools ideal for SMBs and individuals looking to build an online presence through their personal blog or business website. The software comes with extensive integration, wide customization, and several built-in templates so you can quickly start your online site. The software provides easy navigation, a dynamic editing tool and previewer to make website building fast and effortless. It even offers numerous elements you can use for your page such as images, charts, buttons, spacers, text, and galleries. among others. It is free to use with basic functionality but can be unlocked to offer more robust features through several affordable pricing plans. 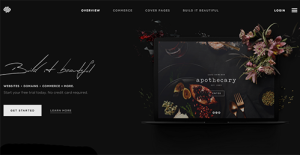 An intuitive website builder software, Squarespace can be used by both individuals and businesses who want to sell their products online and provide their site visitors with rich online experience. It can also serve as a platform for bloggers and individuals who just want to set up their own websites. Using the software, users can create visually stunning websites that are highly-responsive to visitors at the same time. Constant updates make the product highly-intuitive, its myriad of features and integrations make site building much easier and more enjoyable. The platform’s editing interface is a bit tricky to use, requiring the creation of a page using a template before any editing can be done. You can add more elements to a page easily with a Content Block feature and can edit in full-screen mode. This is quite easy to learn as a built-in help box guides you through the entire process. Useful tools include the ability to add logos, use the app’s Style Editor and switch templates. You can easily change template colors and fonts if you choose to. You can tweak colors for specific buttons, links and headers. Online photo editing is also possible with the tool thanks to its integration with Aviary. It can also search for Getty Images photography, preview them and purchase licenses at a discount and use them on your website. If you want to to blog, the solution can add any content to a blog post, which you can add to web pages that you create. Posts can be saved and scheduled and published at a later time. You can include icons for comments, sharing and liking your posts and enable an RSS feed. What’s even better is that you can use email to create new posts and even set it up for iTunes podcasting. Squarespace is ideal for those who want to earn money from their websites. Product pages can be easily added to start selling immediately. You can sell virtually anything on sites created with the app, from physical goods to downloadable products and services. A shopping cart can be added to your page with every single product having its own page and URL. The software lets gives you a couple of payment gateway options–Stripe and PayPal. Express checkout can be set up and terms of service and privacy agreements published. To make things even better, you get to have accounting support with Squarespace’s integration with Xero for as low as $9 per month. Websites built using the platform get to avail of SEO and marketing tools, which can better connect you with customers through social media channels such as Facebook and Twitter. Lastly, you get to enjoy unlimited cloud hosting and 128-bit SSL encryption. If you are considering Squarespace it could also be a good idea to examine other subcategories of Best Blog Software collected in our base of B2B software reviews. Each enterprise is different, and can need a particular type of Blog Software solution that will be adjusted to their company size, type of clients and staff and even individual industry they cater to. You should not count on getting a perfect software that is going to be suitable for every business no matter what their background is. It may be a good idea to read a few Squarespace reviews first and even then you should keep in mind what the solution is supposed to do for your business and your employees. Do you require an easy and intuitive app with just elementary features? Will you really make use of the complex functionalities required by pros and big enterprises? Are there any specific features that are especially practical for the industry you operate in? If you ask yourself these questions it will be much easier to locate a reliable software that will match your budget. We realize that when you make a decision to buy Website Builder Software it’s important not only to see how experts evaluate it in their reviews, but also to find out if the real people and companies that buy it are actually satisfied with the product. That’s why we’ve created our behavior-based Customer Satisfaction Algorithm™ that gathers customer reviews, comments and Squarespace reviews across a wide range of social media sites. The data is then presented in an easy to digest form showing how many people had positive and negative experience with Squarespace. With that information at hand you should be equipped to make an informed buying decision that you won’t regret. What are Squarespace pricing details? What integrations are available for Squarespace? Pros: The platform is user-friendly and it is great even for beginners. As someone who runs photography business and travel blog this tool helps me to run both businesses smoothly. I can easily incorporate an e-commerece component to my websites and I can easily sell items by connecting it to Squarecash account. Also, it offers great set of templates and you can even create your own. Cons: It is expensive solution, purchasing domain without including the live site is another $120 and with this platform a year cost is $20 per year. Also, they could work more on their customer service because I can hardly find someone to talk with during the business hours. They could make 24/7 service. Pros: I like that I can easily run my website and streamline all the processes. It allows me to design my own templates. It has great interface and it meets my needs. Through its interface I can easily manage all the tasks regarding to my website. Cons: It has some issues when it comes to SEO, they could make it more clear to its customers who SEO works within the platform, so if you search an SEO friendly website you’ll need to do some thorough research over SquareSpace’s basics because if you stick to their basic recommendations you cannot optimize it correctly. If you need more information about Squarespace or you simply have a question let us know what you need and we’ll forward your request directly to the vendor.